Our genes determine to a large extent who we are as individuals and why we are different from the other human beings. 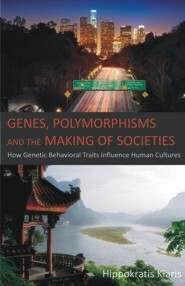 In this book, Hippokratis Kiaris explores how various genetic polymorphisms in different ethnic populations may affect the development of distinct cultures and eventually historical decisions. It should be read by anybody interested in history, anthropology, behavior, psychology or genetics. The reader will find clues linking together these scientific disciplines and how such genetically determined behavioral traits may play an undervalued, as yet, role in shaping historical outcomes. The book initially describes some basic concepts on genetics and proceeds with an outline of human evolution, the journey of early humans Out-of-Africa, and the colonization of Earth by different human populations that eventually resulted in the development of different cultures. Then, by focusing on the two major prototype cultural lines, the Eastern and the Western, the author discusses differences in the corresponding civilizations in view of specific genetic polymorphisms that affect behavior and differ in frequencies between people of Asian and European origin. Finally, in view of the contemporary increasing tendency for cultural globalization, the book attempts to predict future trends on cultures and behavioral patterns. Hippokratis Kiaris teaches Biochemistry at the University of Athens Medical School. He studied biology at the University of Athens and received his Ph.D. at the University of Crete. Before he joined the Faculty of the University of Athens he performed postdoctoral research at Tulane and Harvard Universities, USA.